This blog post is being wrote on an Acer Chromebook. It is the first thing that I have try to create on this new unit that I bought for 199.00. My first thoughts are that this unit is blazing fast. It boots quickly and responds with lighting speed. it has 500 gig of storage and 4 gig of ram. I could easily see this in the hands of children. It has a webcam and hookup to the wireless network was a breeze. 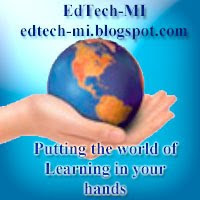 This is part II of the presentation on Blended Learning. In this presentation, we will go over some of the main benefits of such a learning environment. Project leadership expert Susanne Madsen uses this quick video to discuss something that even the most seasoned project manager has difficulty with: estimation. Madsen provides tips and tricks to make estimation easier and more accurate, including the use of workshops with users, creating prototypes, and being as detailed as possible. Much of Baden-Powell’s vision for Scouting still holds true today. But put this one in the category of something B-P never could have predicted. Today the Boy Scouts of America releases Programming merit badge, an elective badge that challenges Scouts to, among other requirements, “write, debug, and demonstrate a functioning program.” Programming MB continues in the BSA’s long tradition of preparing young men for modern-day careers, so I’m a big fan already. The merit badge’s requirements are available below. Scouts may begin working on Programming MB once pa"
iOS 7 updates with an emphasis on education: what can we expect? iOS7 to become educational friendly but will it be enough? The question will yet to be seen if this iOS 7 update will be enough on a move in the right direction to make the iPad educationally friendly. This has been one of the biggest criticism of the iPads is there functionality when it comes to MDM Management and how to set them up to work well when not done in a 1 to 1 environment. Here is the information off of Apples website. Hopefully we will see soon. It would have been nice if this had been released prior to summer when we are all busy doing the system upgrades to be ready for the fall start of school. iOS 7 is the most significant update since the original iPhone. And for education, iOS 7 offers new features designed to make it easier for institutions to put devices in the hands of students. iOS 7 provides powerful new ways to configure and deploy devices across institutions and features to help schools purchase, distribute and manage apps with ease. App Store license management, seamless enrollment in mobile device management (MDM) and single sign on are just some of the capabilities in iOS 7 that make it ideal for education. The App Store Volume Purchase Program now offers institutions the ability to assign apps to users while keeping full ownership and control over app licenses. Institutions purchase app licenses through the VPP website, and can use their MDM solution to assign apps to students, faculty, and staff over the air. Students can enroll with their personal Apple IDs without providing it to their institution, and apps are placed in their purchase history for self-service download, or are installed automatically via MDM. Apps can be revoked at any time and reassigned to other students. In addition to iOS apps, VPP now also supports the purchase of Mac apps and even books, so students can be provided all the tools they need to get their work done. The MDM protocol in iOS 7 includes a number of new commands, queries, and configuration options that make third-party MDM solutions even more powerful. Wirelessly set up managed apps, control which accounts and apps can open certain documents, configure accessibility options and AirPrint printers, and restrict changes to accounts. Teachers can remotely lock or unlock iOS devices into a specific app, such as an assessment app, ensuring that all students are on the same activity at the same time. With automatic device configuration, new devices purchased by a school can be wirelessly enrolled into their MDM system during setup. In addition, new devices can be placed wirelessly in supervised mode, which enables enhanced management options. With streamlined MDM enrollment, users can be up and running quickly without the need for manual configuration by IT. Authenticating into your institution’s apps is now as simple as doing it once. Single sign on (SSO) means user credentials can be used across apps. Each new app configured with SSO is able to verify the user is allowed access to institutional resources and login without requiring them to enter their password again. AirDrop allows users to transfer photos, videos, or documents between iOS devices making it easy for teachers and students to collaborate. Users just tap the Share icon within an app and select the person they want to share with. AirDrop does the rest using Wi-Fi and Bluetooth. Transfers are encrypted, so all their work is highly secure. New management options aren’t just for iPhone, iPad, and iPod touch. Now Apple TV can also be enrolled in MDM, allowing configuration of settings like Wi-Fi and default language. iOS devices can be pre-configured with AirPlay destinations using configuration profiles. And MDM can prompt a student to mirror their screen on a specific Apple TV, so teachers can easily put their work on the big screen. Enroll students of all ages in iTunes U, iCloud and more.Students with Apple ID can have an enhanced personal experience with access to great online services like iTunes U, iCloud backup, and the ability to receive licenses in the new Volume Purchase Program. And now schools will have a program to facilitate Apple obtaining verifiable parental consent for personal Apple IDs for students under age 13. Caching Server 2 supports iOS 7. Caching Server 2 speeds the download and delivery of content through the App Store, Mac App Store, iTunes Store and iBooks Store. By caching purchased content on an institution’s OS X Mavericks Server, your students and faculty get faster downloads of all their content including software updates, directly to their iOS 7 devices. 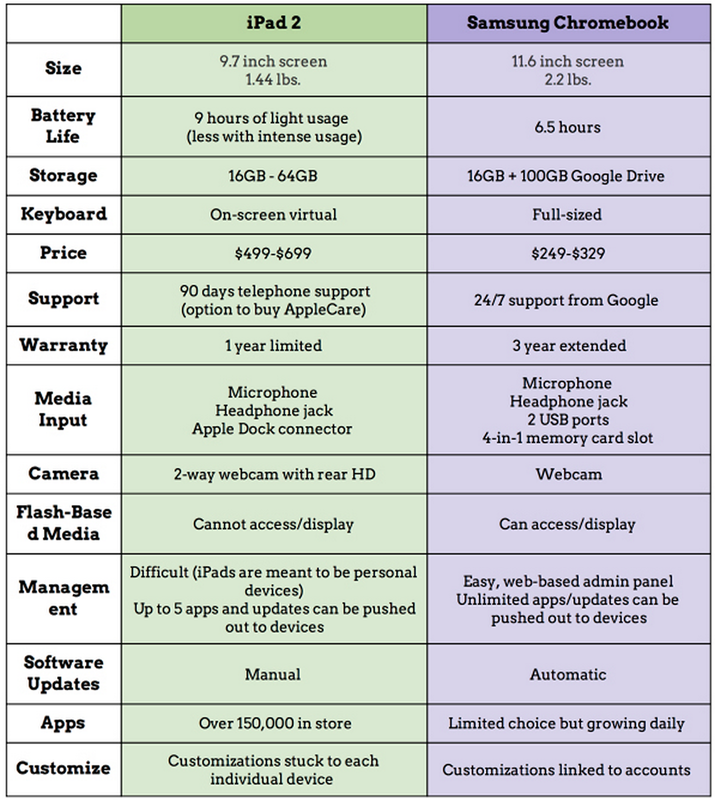 If you are working or planning for a 1:1 program for next school year and still did not make up your mind about what devices to work with, the chart below is probably what you need to help you make informed decision. 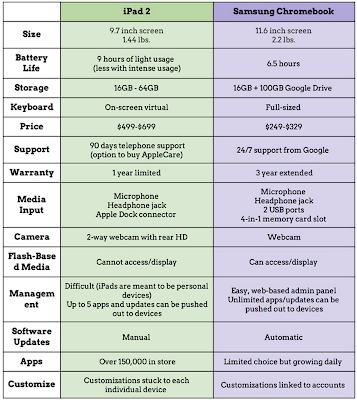 Teachbytes created this handy chart in which she compared the specs of iPad with Chromebook. As you can see, apart from the powerful battery iPad has, Samsung Chromebook outsmarts iPad in all the other features. graphite | Ingredients for effective teaching: "There are no limits to what a great educator can achieve when they have the right tools. Graphite, a free service from Common Sense Media, helps teachers find, understand, and share the best digital learning products available." This is a good site to help you find apps for your classroom and some are even FREE! Do you know what you're districts total cost of ownership is for technology education? Tech Learning : The True Cost of Tech: "Ziften"
Are we not educating our population to control them? HOW TO CONTROL PEOPLE by Charley Reese The difference between true education and vocational training has been cleverly blurred. Here are a few tips on how smart people can control other people. If any of this rings a bell - Well, then wake up! The first principle of people control is not to let them know you are controlling them. If people knew, this knowledge will breed resentment and possibly rebellion, which would then require brute force and terror, and old fashioned, expensive and not 100 % certain method of control. It is easier than you think to control people indirectly, to manipulate them into thinking what you want them to think and doing what you want them to do. One basic technique is to keep them ignorant. Educated people are not as easy to manipulate. Abolishing public education or restricting access to education would be the direct approach. That would spill the beans. The indirect approach is to control the education they receive. It’s possible to be a Ph.D., doctor, lawyer, businessman, journalist, or an accountant, just to name a few examples, and at the same time be an uneducated person. The difference between true education and vocational training has been cleverly blurred in our time so that we have people successfully practicing their vocations while at the same time being totally ignorant of the larger issues of the world in which they live. The most obvious symptom is their absence of original thought. Ask them a question and they will end up reciting what someone else thinks or thought the answer was. What do they think Well, they never thought about it. Their education consisted of learning how to use the library and cite sources. That greatly simplifies things for the controller because with lots of money, university endowments, foundations, grants, and ownership of media, it is relatively easy to control who they will think of as authorities to cite in lieu of doing their own thinking. Another technique is to keep them entertained. Roman emperors did not stage circuses and gladiator contests because they didn’t have television. We have television because we don’t have circuses and gladiator events. Either way, the purpose is to keep the people’s minds focused on entertainment, sports, and peripheral political issues. This way you won’t have to worry that they will ever figure out the real issues that allow you to control them. Just as a truly educated person is difficult to control, so too is an economically independent person. Therefore, you want to create conditions that will produce people who work for wages, since wage earners have little control over their economic destiny. You’ll also want to control the monetary, credit, and banking systems. This will allow you to inflate the currency and make it next to impossible for wage earners to accumulate capital. You can also cause periodic deflation to collapse the family businesses, family farms, and entrepreneurs, including independent community banks. To keep trade unions under control, you just promote a scheme that allows you to shift production jobs out of the country and bring back the products as imports (it is called free trade). This way you will end up with no unions or docile unions. Another technique is to buy both political parties so that after a while people will feel that no matter whether they vote for Candidate A or Candidate B, they will get the same policies. This will create great apathy and a belief that the political process is useless for effecting real change. Pretty soon you will have a population that feels completely helpless, and thinks the bad things happening to them are nobody in particular’s fault, just a result of global forces or evolution or some other disembodied abstract concept. If necessary, you can offer scapegoats. Then you can bleed them dry without having to worry overly much that one of them will sneak into your house one night and cut your throat. If you do it right, they won’t even know whose throat they are cutting. Course Builder packages the software and technology Google used to build our Power Searching with Google online course (www.powersearchingwithgoogle.com). The first time we offered Power Searching, 155,000 students registered and over 20,000 students completed the course.